Let the description in the title for today’s Nice Price or Crack Pipe Jeep sink in for a minute and then wonder why it’s not sitting in your driveway right now. Maybe its price has something to do with it? SUVs, crossovers, or whatever you want to call them have been decimating other automotive classes now for the better part of 30 years. They are so prevalent in the landscape at present that they’re now even eating their own. Yesterday’s 2014 Nissan Xterra Pro-4X was evidence of one of those cannibalistic casualties. The mid-sized, body-on-frame AWD wagon is a relic of a bygone era, and while that low-mileage and stick-equipped Xterra may have seemed a prime candidate for a last hurrah, its $26,990 price tag ensured it was not to be. In the end, that price and the Xterra fell in a 75-percent Crack Pipe loss, closing yet another chapter in the SUV saga. Think of all the things you want out of life. I mean things like love, glory, respect, and socially acceptable flowery flatulence. I’ll bet you that topping that list, lording over all other aspirations, is the desire to own a Jeep Wrangler pickup with a Mercedes diesel under its hood. You’re in luck because here we have just such a beast. As presented in its ad, this in fact is a 1994 Jeep Wrangler YJ Pickup with a turbo diesel and a five-speed stick between that and its 4WD. I’ll give you a moment with your thoughts to let that register. The truck is obviously a project and according to the ad it’s one that has yet to reach its wrap party. The seller notes that the truck was taken down to its frame which was then lengthened, strengthened, and provisioned with a new coat of paint. Onto that was bolted a 1983 Mercedes OM617 five pot turbo diesel—one of the greatest engines ever conceived—and a stout Aisin AX15 five speed manual gearbox. Lifter springs below keep everything out of the muck. A modified body, shortened to match a Scrambler roof, has been poly mounted to the frame. Behind that is a pickup bed made of wood. Now you may think that’s a little too second pig for your tastes, and the seller does admit as much by noting that a metal bed was in the cards. It seems he’s just not gotten around to it. I don’t think it matters, that wooden bed seems perfectly serviceable and unless you live in termite country, should suffice for a couple of seasons more at the least. Of course, this being a project there are a number of issues. They’re all well detailed in the ad—props to the seller for teeing up the truthiness—but none should really be a deal killer for someone with a modicum of mechanical ability and the wherewithal to better mankind. The most notable of the issues include a few oil leaks from the engine. The seller suggests that the mains may be on their way out but says that pulling the motor is a simple enough task in the Jeep. Fuel injectors too seem to be ready for retirement, but new nozzles are included with the purchase and may even be installed by the time the title changes hands. Other driveline elements are apparently weeping a bit but it doesn’t seem like it’s all going to go bone dry in a week. A rebuilt steering system and brakes work counterpoint to all the negative nelly-ism. Visually, the truck is a bit rough. But then, that’s part and parcel with its appeal. It’s sort of like five-o’clock shadow on Ryan Gosling, or Christina Hendricks with bed head. You know, it’s a bit of a hot mess. That being said there doesn’t seem to be anything egregious here. The floorboards are intact so you won’t be Fred Flintstone-ing the truck. And, while the seats are ripped and torn, lest your baseball nickname being Pant-less Joe you’ll probably never even notice. I have to add that the ViseGrip® window crank on the driver’s door is a nice touch of industrial abstraction. Despite the obvious and less so obvious flaws, the truck has passed Vermont inspection. That means it will likely be good to go in your state or country as well. The title is clean and while the ad notes 180,000 miles, I think we will all agree that it doesn’t really matters. The seller estimates that he has about $16K in parts in the truck, but feels that it’s unique and iconoclastic nature makes it difficult to accurately ascribe its value. That doesn’t stop him however for listing the Jeep at $9,000. What we now need to do is figure out if he’s hit the right spot with that price. 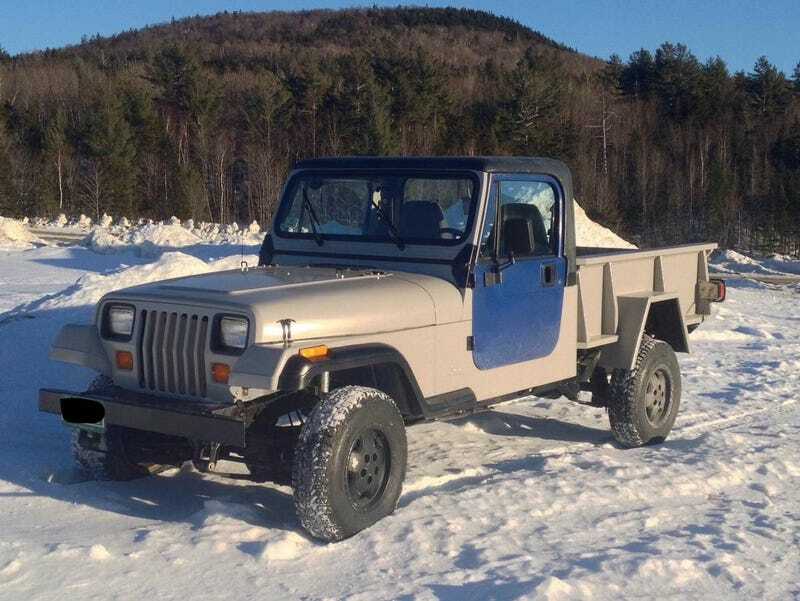 What do you think, is this project Jeep worth that sort of cash? Or, is $9,000 for too much to ask when so much of the project is left undone? At $26,990, Could This 2014 Nissan Xterra Pro-4X Prove Far From X-tinct?